Feelings get triggered. Conquering the summit gives José Manuel great excitement and brings out he child we all have in us. 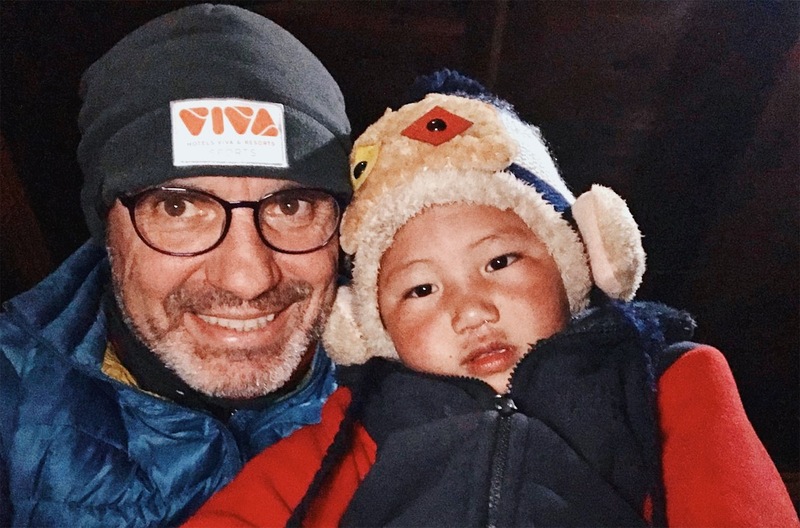 The harshness of the mountain makes him think about how hard life is and this thought gets him closer to the most vulnerable in this part of the planet: children. I feel brought back to my childhood. The mountain turns us into children because it makes us vunerable, curious and sensitive. A feeling of absolute fragility appears after completing something most people consider as a simple physical challenge. But the truth is the permanent mark of that wild nature is carved more deeply in your mind than in your body. Our eyes feel like those of a child and cannot help be speechless in front of such unknown beauty. Finally, our skin, weather-beaten by the cold and burnt by a wind which still roars in our ears, becomes a see-through material which filters everything. Once we arrived at Base Camp, I got into my tent, turned on my camera and couldn´t help starting to cry. Descending from the Himlung’s summit was very hard. An exhausted body and a tired mind because of so many hours of concentration are the perfect combination for an accident. Experience teaches you the real finish is not on the summit but at the feet of the mountain. That is the place where you feel defenseless and feelings explode. Suprised by that short lack of emotional control, I checked the recording later and I found a mixture of joy, fear and infinite gratitude to the people who helped me make my dream come true. It was a voice broken by the effort, a whisper as thin as the air I was breathing. The voice of a 48-year-old child. Fortunately, there are younger children than me in Nepal and they cry less than I do. They have the amazing ability to smile in spite of poverty and the lack of opportunities of this country. 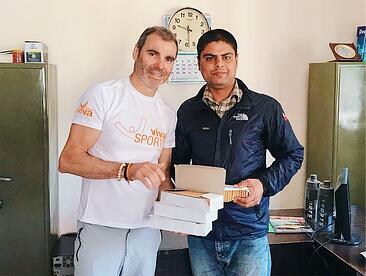 Thanks to the support of VIVA Hotels, I carried all the stationery I could fit in my luggage from Majorca. I intended to give it to the school in Koto, a tiny village at the beginning of the reserved area of Manaslu. But the classrooms were closed due to the Diwali Festival, one of the most important in Nepal. I always think that God writes straight on a crooked line. That setback made me look for another school to make the donation. That’s how I got to know the Disabled Newlife Centre (www.dncnepal.org), an institution in the Kathmandu valley where physically disabled children are fostered. Some 40 under eighteen children board there. They get schooling, healthcare and physical therapy from this centre which is financed by private donations. You start to believe in mankind again when you see the amount of work these people put on these small beings with a really big heart. These children, whose life is much more difficult that the majority of their neighbours’, give me the last lesson from the Himlung’s challenge: There are more smiles than tears in front of adversity.